In the second of our new series profiling the talented builders with whom ENVE works, we meet Firefly Bicycles, from Boston, USA, a vastly experienced quartet of a titanium persuasion. Custom frame builders are a passionate bunch, as they’ll all tell you, and it’s hard to imagine doing such a job without that unblinking enthusiasm. So, if you want to get to know a builder, hearing that they’re passionate about bikes isn’t enough. You need to drill down and find the focal point, where passion becomes true love. 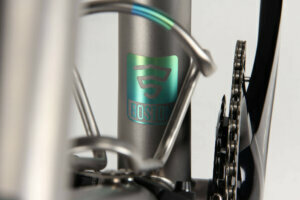 For Firefly Bicycles, it’s titanium. “We love titanium,” Firefly’s Kevin Wolfson tells us. “We love its ride quality, light weight, and durability. We love that you don’t have to paint it; we love doing these custom finishes that stay true to the material and highlight what’s possible with raw titanium.” Indeed, a Firefly finished with the full complement of brushed, blasted, and polished surfaces – plus the brand’s unique, dye-free anodised graphics which bring out the metal’s oily hues – wears its molecular make-up proudly. This is maximum titanium. “Titanium offers the greatest versatility of any material. There are many different tubing dimensions that we can take advantage of, and it’s a relatively easy material for us to manipulate and machine. We can take a pretty raw set of tubing and customize it to each individual rider’s needs. Ah yes, experience, the gold bullion of consumer trust currencies in these days of feedback score fairy dust. 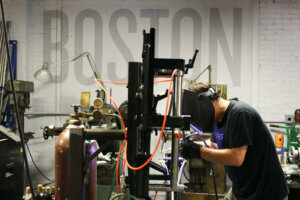 Prior to establishing Firefly Cycles in 2011, Kevin, Jamie, and Tyler all previously worked for Independent Fabrications – for 2, 12, and 13 years respectively – and Tyler had welded for Merlin Metalworks before that, so they have nearly half a century of titanium bike building behind them. That’s important, because this metal is notoriously hard to work with. What was the first bike that the fledgling Firefly made in that small shop? Although stainless steel didn’t stay on the menu for long, Firefly isn’t blinkered to other materials. In fact, even before the company had been formed, the three friends were mulling on an idea for a hybrid titanium-carbon frame that would capitalize on its construction to deliver a highly customized ride thanks to bespoke carbon fiber tubes made to spec by ENVE. It can be easy to assume that bespoke builders are able to sidestep out of the technological arms race in which the mainstream brands are locked – not for the artisans the frantic iterating in search of a headline-worthy gram saving – but they still exist in the same world and, to an extent, are beholden to an agenda set by the giants. Like mice scurrying between the feet of elephants, builders such as Firefly must turn their diminution to their advantage as they keep pace with the industry’s stream of new standards through sheer agility. “Because we’re a small company, we’re very flexible,” says Kevin. “Tires for road, gravel, and all-road bikes are getting wider faster than big companies can respond with two- or three-year model cycles, but we can react very quickly. “There are a lot of ways we can innovate, too. We developed our own in-house tube butting technology which was a big step forward for us. 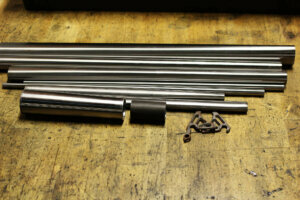 Before that we’d been using a mix of stock butted tubing and thin-walled, straight-gauge tubing. Now we have a CNC lathe dedicated to butting tubing. In almost every frame that we make, all of the main tubing is custom-butted for the individual rider. It gives us far more scope to customize the ride quality. 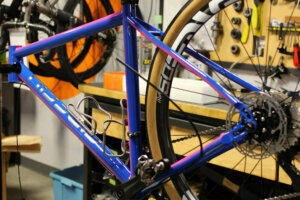 Our current project is working on a new technology that would add even more tire clearance but with shorter chainstays. When the builds look this good – “Every bike is a show bike,” says Kevin – it’s no wonder Firefly has an irresistible Flickr compulsion. 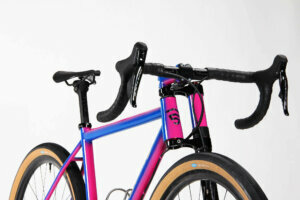 Every single bike gets photographed, not only in a studio upon completion but also during the build. Owners are presented with a photobook when they collect their bike which, when you think about what a special purchase such a bike represents and how long it’s likely to be kept, is no more than appropriate. In fact, to do otherwise would be like not getting wedding photos. We’d even speculate that many of these relationships last longer. A Firefly, bespoke to you in every regard, is the very definition of a keeper.